When I told my girls I was rallying them for a street fair last Saturday, I couldn’t help but notice a slight resistance. Not that I blame them; the days of generic falafel and shawarma booths beside kettle corn and funnel cake stations are numbered. But street fairs have come a long way, baby, and there’s a new kid on the block. No, I’m not talking NKOTBSB; this year Hester Street Fair has got the right stuff (oh oh OOH oh). My perfect little Saturday started after a nice walk down Essex; we met up at the fair’s entrance on the corner of Hester and Essex – can’t miss it. There’s a lot of action in there, so pace yourself, take a lap and scope out the goods before your decide on your first eats. 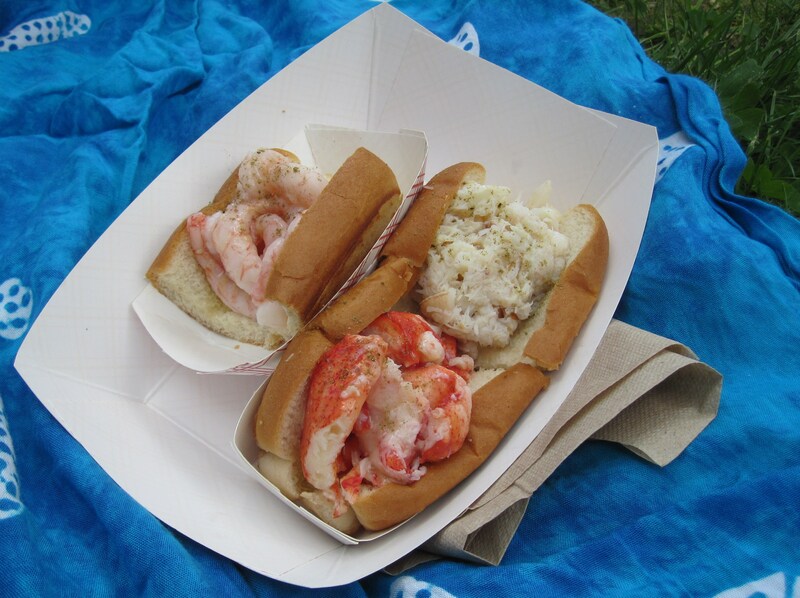 After doing a once over, we decided to get on board with Luke’s Lobster (OMFG – it was my first time with Luke…) The combo of ½ Shrimp/Lobster/Crab rolls ($19) was AMAZING – a great savory kick-off to the eating festivities. 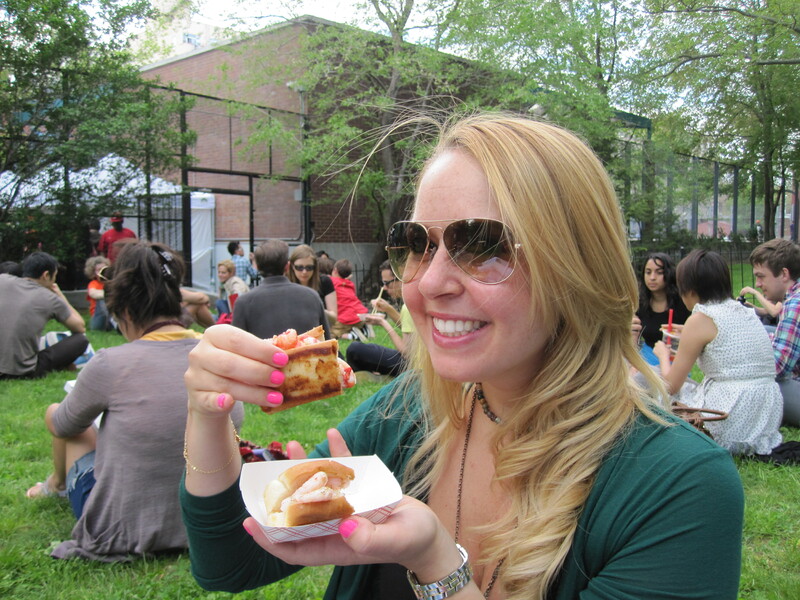 After sating our initial cravings, we took some time to peruse the other vendors. Vintage jewelry and eclectic clothiers were a-plenty along with some other interesting additions like the Casa Helecho Terrariums (I’m going to go back and further investigate these – get my geek on). 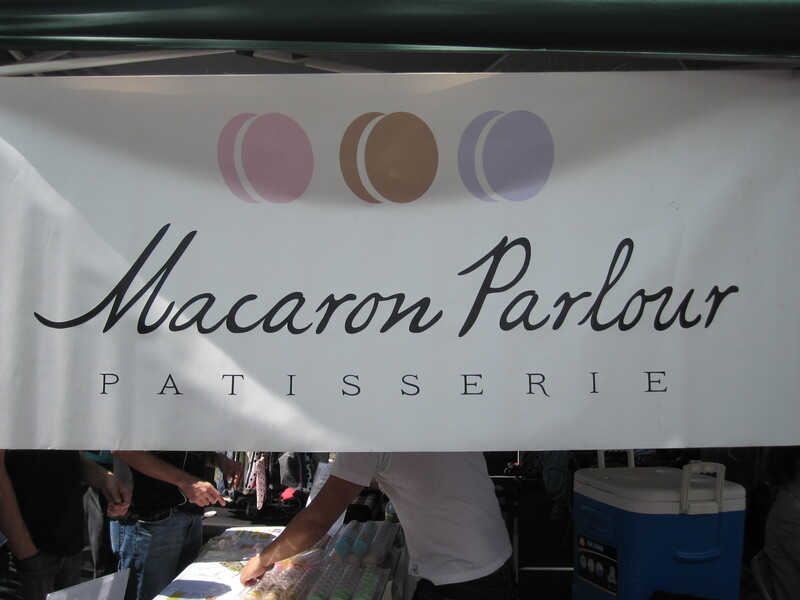 The live music added to the festive atmosphere as we sampled pretzel rods smothered in Herbin’ Spoonful’s Habanero Caramel (mmm) and grabbed small delights from the Macaron Parlour (the Red Velvet was decadent and the Caramel Fleur de Sel, a perfect savory/sweet combo – $2 each). 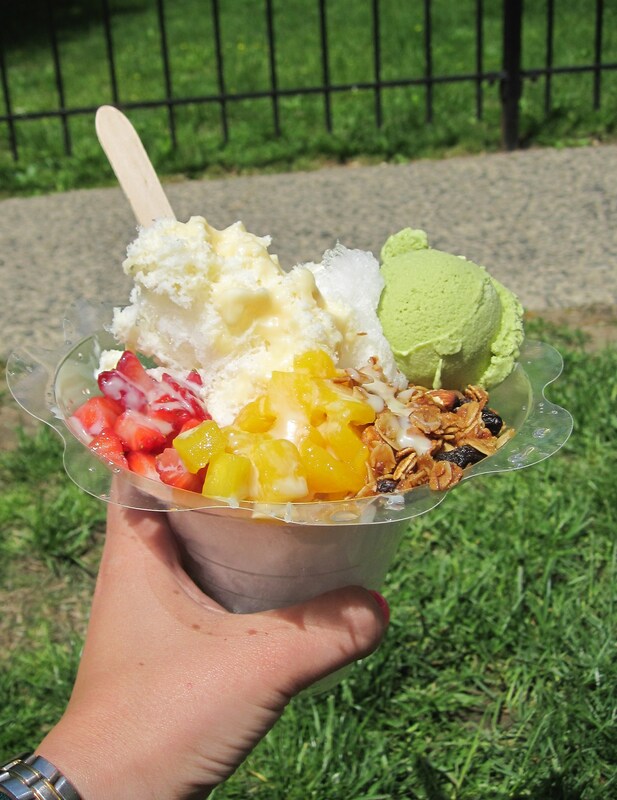 One of the most popular vendors of the day was the Shaved Ice Shop – your “sundae” consists of finely shaved ice, drizzled with condensed milk and topped with your choice of fruits, nuts, granola, and some more surprising delights (red beans, anyone?) PLUS a scoop of sorbet or ice cream. At $5 a pop, it won’t hurt the wallet and on a hot day, it’s the perfect treat to take to the small lawn area just beyond the vendors – a small sheet to sit on isn’t a bad call either. The Fair will be open for business from 10am-6pm on Saturdays through October 30th – you’ve got more than enough time to check it out, but don’t miss it. Next time your Saturday leaves you jones’ing for some open air, great music and gourmet treats, get yourself to the Hester Street Fair – it’s a force to be reckoned with. I’m putting all other clichéd street-closing-fests on notice.